It has been chaos around here...we finished building our house and Firday was moving day! We are swimming in boxes! We are busy unpacking and trying to clean up our old house to get it ready for our renters. I got my sewing machine unpacked and all set up, but I think it will be several days before I find any time to sew, so in the mean time, I am sharing a project I finsihed before our big move. I tackled a new challenge last week and made a swimsuit for Em! I used the new Elisa top by Filles a Maman and the Jocole basic briefs Jocole basicbrief pattern for the bottoms (you can see my full review of the top over at Pattern Revolution). It was surprisingly easy to make, and so so cute! I used some swim knit I got from GirlCharlee (you can find it here). It is a nice thick Nylon Spandex and it was pretty easy to sew with. I bought in a lot of slightly flawed fabrics, some of the dots are smudged, but they were easy enough to cut around. We do a ton of swimming and have a beach vacation planned for next month so I know this suit is going to get a ton of use this summer. Once I get my sewing machine fired up again I have two more swim knits I bought in the same lot and I can't wait to sew a couple more suits! Oh my, she is absolutely adorable! 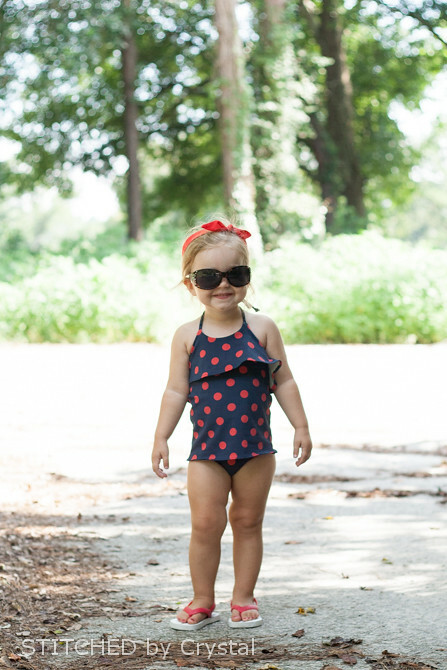 She is a natural at being a swimsuit model. 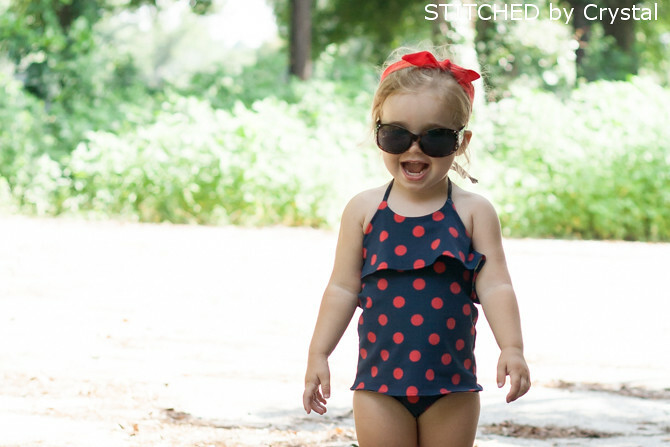 I love the cute polka dot fabric you used for the swim suit. It such a cute design too. Congrats on being successful at your first swim suit sewing adventure. Thanks Melissa! It was easier than I expected! This is so adorable! I love that you didn't use a conventional swimsuit pattern!